The Storer Foundation and Teton Science Schools recognized all four recipients at a special event hosted by the College of Education at the end of the spring semester. Undergraduate recipients are: Camille Hawkins, Sheridan, secondary mathematics education (concurrent major in mathematics); Mary Goetz, Laramie, elementary education and Spanish; and Mariel Pfeifer, Hulett, secondary science education (concurrent major in microbiology and biology). Graduate recipient is Ashley Allen, Fort Collins, master of science in natural science (science education). 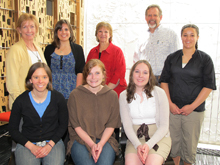 Fellowship recipients received cash awards from the Storer Foundation. In addition, all four scholars will attend a place-based, science education training course the week of May 21-25, at Teton Science Schools in Grand Teton National Park. In July, the four Storer Scholars will travel to Saratoga to teach a one-week outdoor, science enrichment program as a part of Saratoga Elementary School’s summer school program. The Storer Scholars will team teach a place-based, field science enrichment program with experienced Teton Science Schools’ instructors. For more information contact Leslie Cook at 307 734-3736 or leslie.cook@tetonscience.org.